So far Kevin Sprague has created 44 blog entries. Barrington Coffee Roasting Company - Water filter replacement tutorial from Joseph Stearn on Vimeo. This video should guide you through replacing a canister water filter without getting soaking wet in the process. We are thrilled to have been invited to prepare cold drip coffee through our Proper brewer at this years TEDx NortheasternU, January 25th in Boston at Northeastern University. Here is a short video of some of the students at the school we sponsor in Brazil called Educafé, These are kids that belong to the farming families at Cafe Conquista where we source the majority of our Brazilian coffee. This performance is for their 2013/14 holiday concert and they wanted to share it with us. 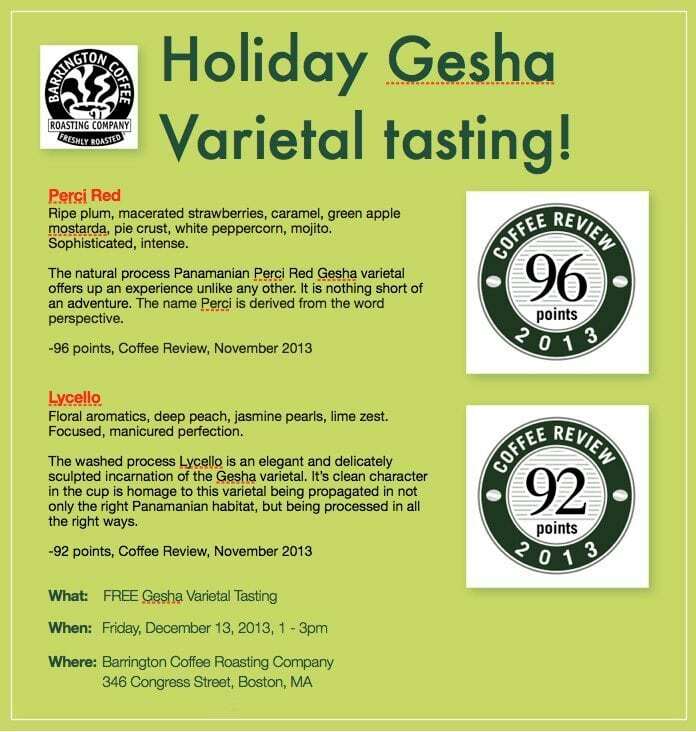 Free Holiday Gesha Varietal Tasting! Come taste the 96 point Perci Red and 92 point Lycello side by side! A video about the importance of water as it pertains to coffee with Barth Anderson by Because Water. Perci Red Receives 96 Points! Blind Assessment: Intoxicating, juicy, complete. Dark honey; dark rum; dark chocolate; complex, layered fruit, particularly pineapple and melon; narcissus-like flowers. Intense but juicy acidity; syrupy mouthfeel. Sweetly rich finish turns slightly drying but still flavor-saturated in the long. 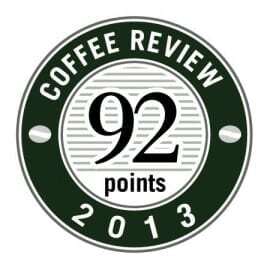 Notes: This exceptional coffee was selected as the #3 coffee in the Coffee Review Top 30 Coffees of 2013. Produced from trees of the rare Ethiopia-derived botanical variety Gesha (also spelled Geisha). With its elegantly elongated beans and distinctive floral and crisp, often chocolaty cup, the Gesha variety continues to distinguish itself as one of the world’s most unique coffees. This is a dry-processed or “natural” version of the Gesha, meaning the beans were dried inside the fruit rather than after the fruit has been removed, as is the case with wet-processed or “washed” coffees. This particular Gesha is produced on the Ninety Plus Gesha Estates. Barrington Coffee is an artisan roaster dedicated to elite coffees, fresh delivery and roasting that foregrounds the coffee and not the roast. 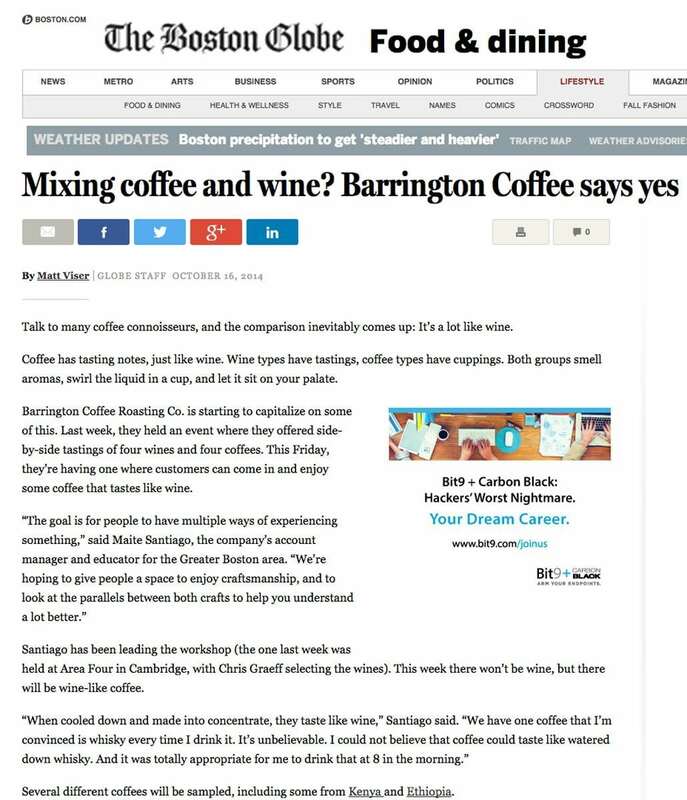 Visit www.barringtoncoffee.com or call 800-528-0998 for more information. Who Should Drink It: An amazing coffee, with an immense range and depth of sensation. Blind Assessment: Delicate but rich; shimmeringly complex. Meyer lemon, jasmine, honey, walnut in aroma and cup. Crisply sweet acidity; silky mouthfeel. Surprisingly deep, flavor-saturated finish. Notes: Produced from trees of the rare Ethiopia-derived botanical variety Gesha (also spelled Geisha). With its elegantly elongated beans and distinctive floral and crisp, citrusy, often chocolaty cup, the Gesha variety continues to distinguish itself as one of the world’s most unique coffees. This particular Gesha is produced on the Ninety Plus Gesha Estates. 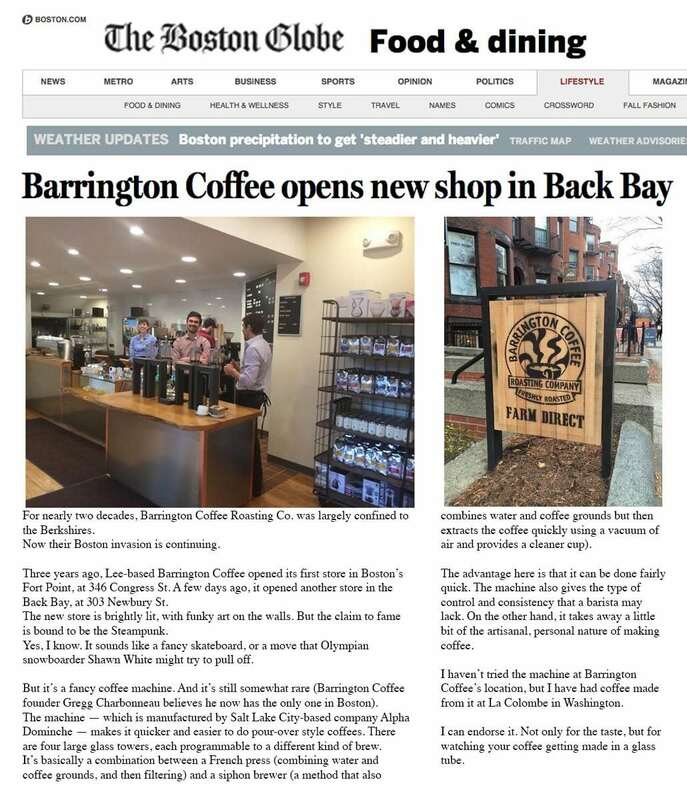 Barrington Coffee is an artisan roaster dedicated to elite coffees, fresh delivery and roasting that foregrounds the coffee and not the roast. Visit www.barringtoncoffee.com or call 800-528-0998 for more information. Who Should Drink It: Precious, delicate, refined, with a quietly layered complexity. Hachira – 2014 Good Food Awards Finalist! Black cherry aroma, juicy acidity rolls into elderberry, herbal tones of shiso, umame and rich dark chocolate liquor. This is the outspoken sister coffee of the Nekisse. Where the Nekisse is delicate, the Hachira is saturated. And this year, the Hachira has drawn the attention of the judges for the Good Food Awards as a Finalist for 2014! Once again, such an auspicious coffee as this has been brought to light by the Ninety Plus Coffee program. We received a Good Food Award in 2011 for our Nekisse. Our Ethiopia Hachira which will be available shortly so visit our store and keep your eye out for it. Blind Assessment: Delicate, complex, lively. Distinct honey and crisply sweet cacao-nib with lavender-like flowers and an herby hint, cilantro perhaps, in aroma and cup. Lively, floral-toned acidity; very light but silky mouthfeel. Lavender in particular carries into a quietly rich finish. 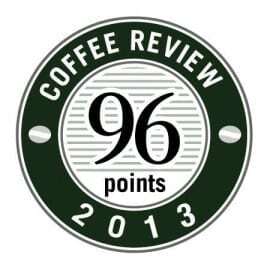 Notes: Ninety Plus is a distinguished boutique exporter and importer of innovative small-lot coffees from Ethiopia and Panama. 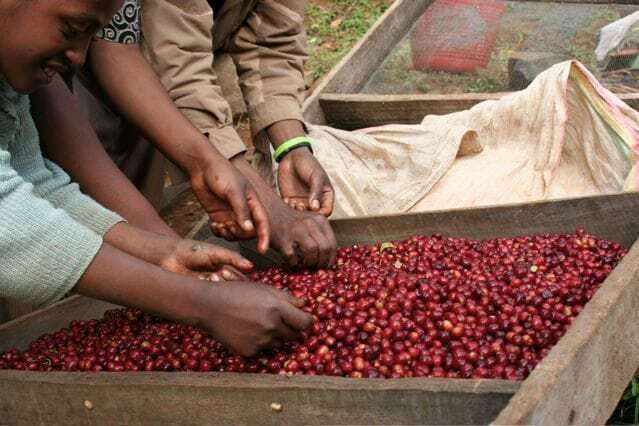 Grown near Neji in the Sidama/Sidamo growing region, this Ethiopian coffee is a dry-processed or “natural” coffee, meaning the beans were dried inside the fruit rather than after the fruit has been removed, as is the case with wet-processed or “washed” coffees. Barrington Coffee is an artisan roaster dedicated to elite coffees, fresh delivery and roasting that foregrounds the coffee and not the roast. 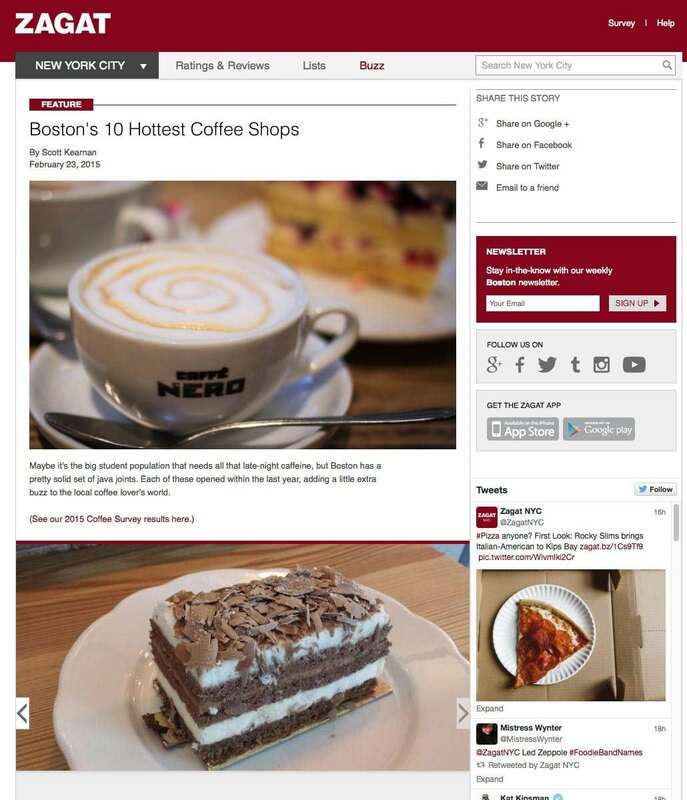 Visit www.barringtoncoffee.com or call 800-528-0998 for more information. Who Should Drink It: A nicely conducted extreme light roast develops the lyric sweetness and delicate complexity of this very pure dried-in-the-fruit coffee. Those who enjoy sophisticated lagers with floral-toned hops might be particular candidates for this one. 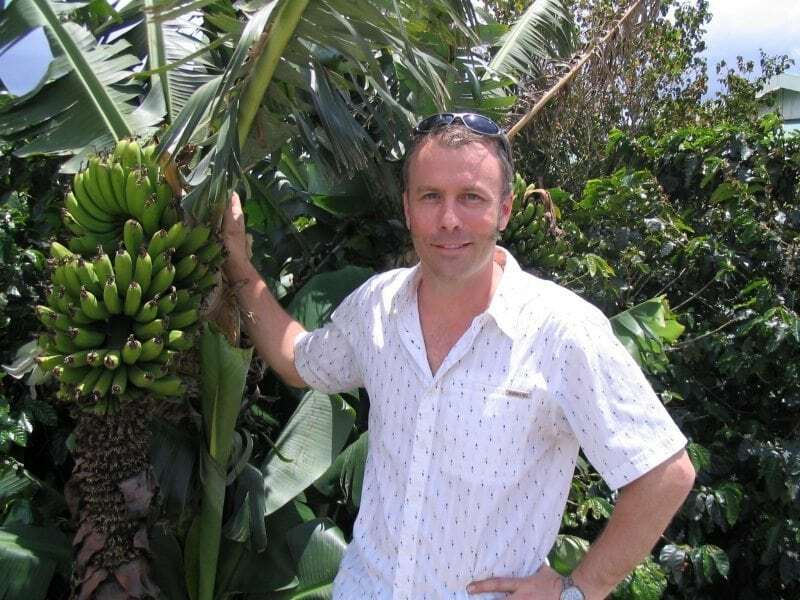 Barth Anderson, green coffee buyer for BCRC at the Doka Estate, a fourth generation family farm in the Central Valley of Costa Rica. How do we source the coffees that we roast? With great care. Each year, Barth procures green coffee samples from the best coffee producers from around the globe. The coffees he identifies hail from small family farms, cutting edge private farms and coffee growing cooperatives. Barth’s sensitivity to cross cultural integration and his ability to communicate in other languages are an enormous asset to our search for great coffee. A relationship that spans over two decades with the Vargas family’s coffee farm in Costa Rica is testament to the depth of such relationships. It is the biologically complex farms that yield complex cups of coffee. These coffees are grown by individuals who put their energy into the stewardship of their farms and the quality of their produce. We view the farms, families, and cooperatives that we work with as strategic partners. Our relationships grow with each year’s harvest, and in many cases our relationships span generations. Extensive information about each of the farms we work with is available from us in the form of BCRC Coffee Cards, as well as online at barringtoncoffee.com. Gregg and Barth have been actively exploring different coffee flavor profiles since they became involved with specialty coffee in the 1980’s. At the Roastery in the Berkshires, the BCRC staff pool their collective senses to evaluate each coffee in the controlled environment of their tasting room. Our tasting room is one of the finest coffee analysis environments in the industry. Water quality, air quality, and equipment calibration are carefully maintained for consistency. Our critique of a coffee involves moisture analysis, sample roasting, the cupping process, serving temperature profiling, and numerous methods of brewing and extraction. -Controlling relative humidity during green coffee storage to enhance body and soften acidity for espresso preparation. There are a multitude of compounds that exist in a coffee bean. 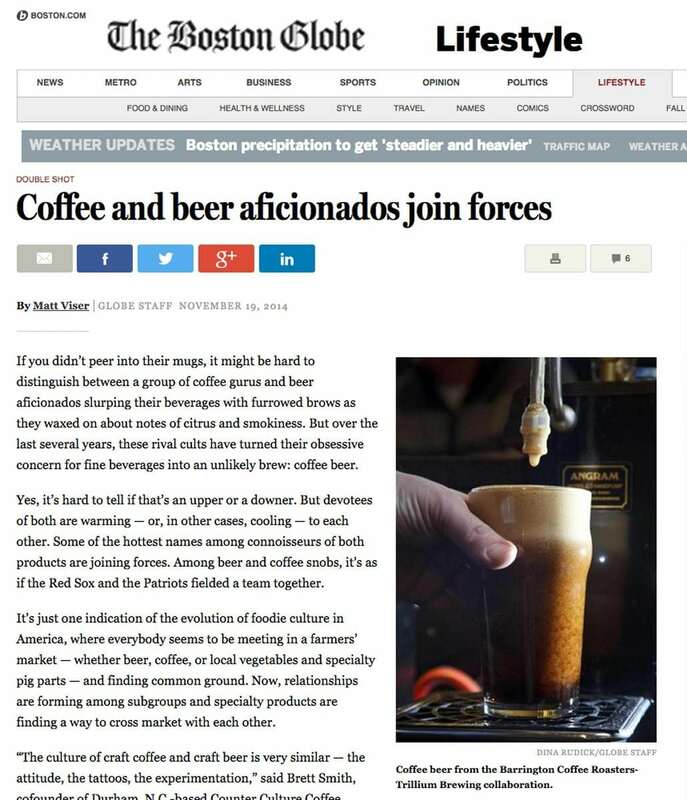 They can either make, or break a coffee’s cup quality. We know that we can protect these compounds in green coffees through barrier protection and careful storage as we do with our Green Seal Program™. Deciding how to hold on to these qualities and how long each coffee’s season will sustain are some of the critical roles we perform as coffee roasters. However, humankind has also known for millennia that aging and conditioning different kinds of food and drink can reveal amazing aromas and flavors. Over the years, we have found that we can actually improve the character of some of the coffees we prepare for espresso by tempering, or otherwise controlling, the storage environment and time period that these coffees inhabit before roasting. We use a variety of aging methods to open up an espresso profile, soften its acidity, and bring to light captivating and otherwise inaccessible flavors that can exist within particular coffee varieties. We call this process our Landed Aging Program™ for espresso coffees. These coffees also have a season, it is just a different one than would be described by a traditional notion of seasonality. Typically seasonality is considered in the context of holding on to something that is fleeting. Landed aging is about developing and transforming something that is hidden within a coffee bean. We have been actively exploring this potential in espresso coffee since the mid 1990’s when we created our Barrington Gold Espresso Blend™. You will also find it noted among some of the Single Origin Espresso coffees that we periodically have available as Limited Offerings. Just as we transform green coffee to roasted coffee, we employ landed aging to impart our style to some of the very special espresso coffees that we offer. You won’t find them anywhere but here. We certainly hope that you enjoy our results. 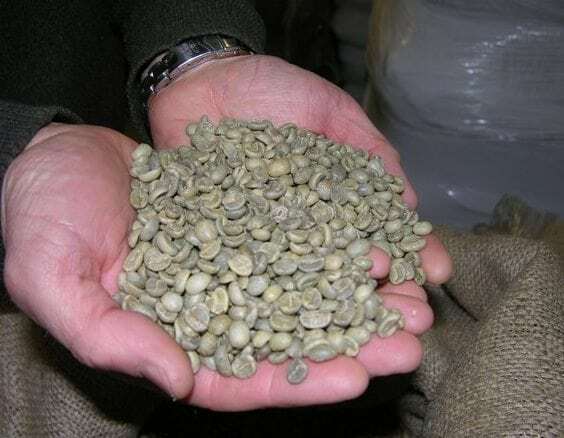 -Hermetically sealing green coffee to preserve freshness and vibrancy in the cup. Is there an ideal way to handle the best green coffees in the world? Yes, very carefully. Coffee beans are seeds from the fruit of the coffee tree. At Barrington Coffee, we care for and roast coffee seeds. We explore and identify the ones we enjoy the most, we preserve them, and we prepare them to order in our artisanal drum coffee roasters five days a week, each week of the year. The coffee farms we work with typically have but one harvest per year. This can present particular challenges regarding seasonal supply and storage. After years of careful testing we have devised methods to preserve these amazing coffees so that we may offer them to you at their peak throughout the harvest season. 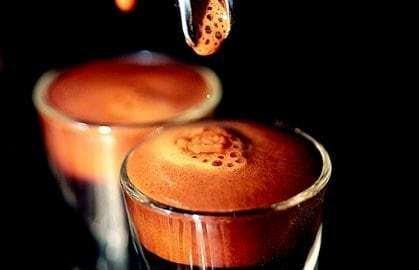 A washed coffee with a particularly lively acidity or a very delicate flavor profile will typically fare best by being sealed against the elements shortly after repose. In some cases we hermetically seal these coffees at the farm even before the coffee ships to our Roastery. In other instances, we may feel that once it has landed, the coffee will benefit by settling down further before being sealed. Pulped natural and natural processed coffees, for example, often benefit from further repose before sealing. We make each of these decisions based upon our critical periodic analysis of how each coffee tastes. We decide when a coffee is at its best, and then we hold the coffee at that spot by protecting the green beans inside environmentally minded, reusable packaging. This is our Barrington Coffee Green Seal Program™. Seasonality regarding coffee beans is not as simple as it may seem at first glance. The idiosyncrasies of provenance and process specific green coffee preservation are a major part of the equation. We know that our conscientious efforts absolutely preserve moisture content, freshness, and peak character profile for even the most critical of brewing methods throughout a harvest year. We see this as the proper way to respect the carefully produced coffees that we are so fortunate to represent. Deciding how we will apply the Green Seal Program™ to a particular coffee is a challenge we really enjoy. We certainly hope you enjoy our results.